Gen Zers turn to social media platforms multiple times a day for practically all aspects of their lives. Naturally, higher education organizations are taking advantage of these influential platforms to market their meal plan programs. Lucky for universities, 84 percent of students want campus dining information conveyed to them through social media, according to a study from Y-Pulse. With a powerful social media meal plan marketing strategy, institutions can reach college students where they already spend a large amount of their time. 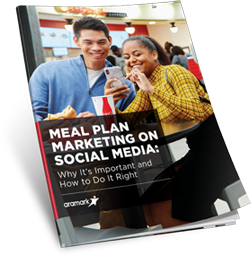 Discover how your higher education institution can take advantage of social media marketing to reach Generation Z and sell more meal plans in this guide.